Last year, Duri released a 6 polish collection inspired by the movie "The Girl with the Dragon Tattoo". I think most of the polishes in the collection may have been repromotes, but they were new to me, so I was pretty excited. I loved the look of the collection and I couldn't wait to review it. Now, part of that is probably because of the movie and the fact that Daniel Craig is my Hollywood boyfriend (:P), but also it just looked like a gorgeous collection. Unfortunately, my life continued it's pattern of topsy-turvy and I just never got around to swatching the entire collection. I chose this polish because, as you may notice, I chopped my nails WAY down, and then I had a break on my pinky (isn't that always the way), and I had to go even shorter. :\ So, I figured a darker polish was in order. When I put it on, I was a little surprised, though it was a good suprise. Maybe I didn't stare at the bottle hard enough before I applied it, but for some reason, I thought this was going to be a charcoal grey base loaded with silver glitter. It's not. It's a gunmetal-grey foil metallic. I love this polish. I had no issues with formula or application. In fact, it applied like a dream and was completely opaque in 2 coats. I also used a coat of Sally Hansen Insta-Dri quick-dry topcoat. I really like Duri polishes. I find them to be fun, inexpensive polishes and they have a wide range of colors and finishes. You can purchase Duri polishes directly from their website and they retail for $5. Angels and Demons was sent to me for review. The above link directly links to the polish pictured and is not an affiliate link. OMG! I've never heard of this collection!! And I just read the books and I LOVE LOVE them!!! I'm in awe with this color (but Angels and Demons?? that sounds more like Dan Brown! ), and I'm googling the whole collection already!!! I hope you'll post more swatches!! Ooh, this looks a bit like Zoya Edyta. Do you know how the two compare? Liesl, I don't think they are similar, but I would be glad to do a comparison for you. 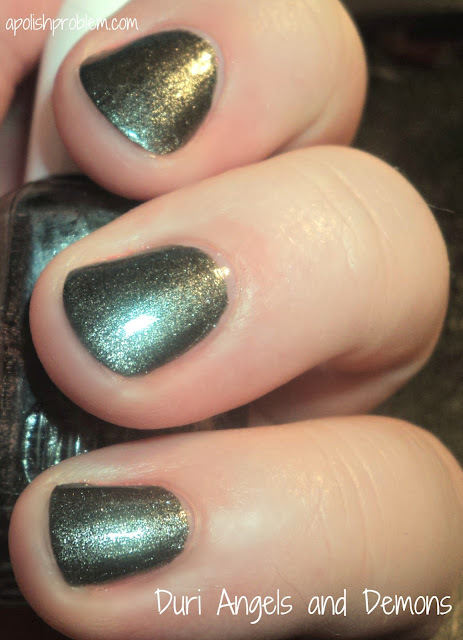 My second picture gives the polish a bit of a greenish tint, but it's definitely a gunmetal. The name did remind me of Dan Brown's book, and I thought it was a little odd, but I did a little bit of digging, and I discovered that most, if not all, of the polish in this collection are repromotes. This polish, for example, was released with 2010's Angels and Demons collection. I think it's something they put together to correspond with the release of the movie and it's not an actual tie-in collection, if that makes sense. I actually like your nails better super-short! They look so tidy and the shape is extremely pleasing! Funny, I can see the gunmetal better today than yesterday.... no comparison necessary. :) I believe you. ;) Thank you, though! Thank you. I have realized that my nails look better shorter as it kind of helps with the issue of them flaring out. However, this is a little shorter than what I'm comfortable with, simply because they are a little harder to polish. When they are a teensy bit longer, I'm less apt to slop polish all over my fingers. LOL. I completely see how you would think it would be similar to Edyta. My desk lamp in the second picture warmed up the color and made it have a green cast.